Syrian fortifications on Mt. Avital, Mt. Hermon in background. Just after Passover, we took a day trip to the Syrian border sponsored by Honest Reporting. After visiting the former Syrian military headquarters, we drove to the Ben Tal nature reserve on Mt. Avital. One of my ways of determining when we are no longer on the usual tourist trail is to look at the informational signs. Common tourist sites have signs in at least three languages: Hebrew, Arabic, and English. Very popular sites might give information in five or six languages. Sometimes the gift shop even lists prices in dollars and Euros, as the one at the Carmelite Monastery on Mt. Carmel does. But when all the signs are in Hebrew, I know I’m no longer in foreign tourist territory. The signs on Mt. Avital, except for the one that says “WC,” are all in Hebrew. The top of Mt. Avital today is a scenic overlook. We can see most of the Golan laid out below us. When it was held by the Syrians, no one visited it to see the beautiful Golan. The Syrians came here to watch Israel, and to direct fire at kibbutzim in the Galil. Today, the Syrian military post at its peak is simply another tourist attraction. The walls around it are low—the bridge over the wall is just a few steps up and down. But the trenches here are deep. Syrian trench on Mt. Avital. Photo courtesy of Linda Pilkington. Each trench runs from one metal lined opening to another. The openings lead into rooms once occupied by Syrian soldiers. This is no longer a military position. Watchers no longer look for signs of invasion across the Israeli border. But we could hear the artillery of the Syrian civil war; we saw smoke rising from a distant town. 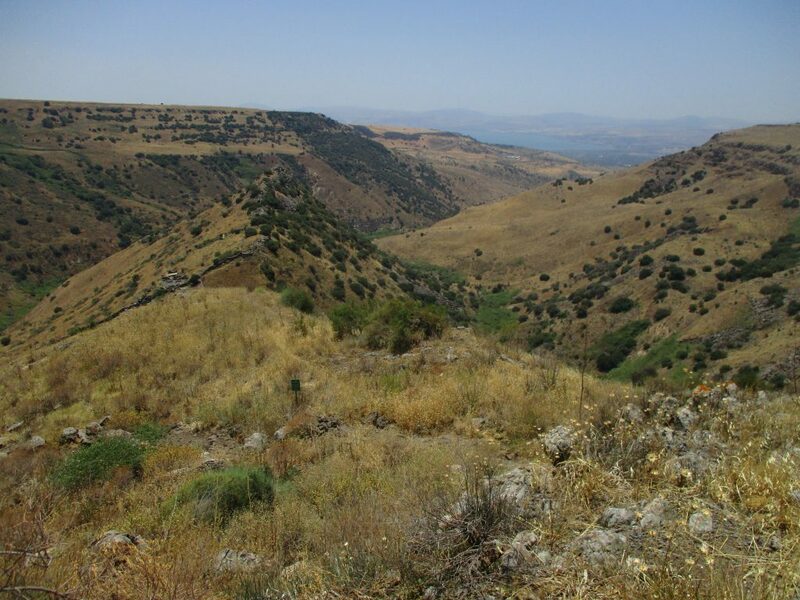 From here we could see the chain of four volcanoes, and how they stand as guardians over the wide Golan plateau. When you see geography laid out in front of your eyes like that, strategic concerns make much more sense. It was obvious why Israel, after capturing these volcanoes and the plateau to their east, did not want to withdraw back behind them. From 1948 to 1967, farms and towns in the Galil had been subject to regular artillery attack from the Golan. On some kibbutzim, everyone slept in underground bunkers. Children had grown up never sleeping in a room with windows. Israel fought two painful wars here. It is not about to return to a vulnerable boundary that would reinstate that situation. Looking at the green hills and the farms around us, it is hard to believe that we are looking at the site of so much war and destruction. It seems strange to us today that Syria had used this fertile land for military rather than agricultural purposes. Such was their hatred for Israel. And here, I learned things about the 1973 war I never knew. Its outbreak surprised everyone I knew. We knew Egypt was conducting military exercises and deploying troops along the Suez Canal. And there had been some activity in Syria as well. But neither of these countries seemed to be seriously preparing for war, according to the news reports. from the Middle East. Most of Israel was surprised as well. But some people had realized a war was about to begin. My carpenter told me that he had served his miluim (reserve duty) summer’s end. When he was about to return home, his commanding officer had told him he would return soon. “The Syrians are going to attack in a month or two,” the commander had said. At a staff meeting the day before Yom Kippur, General Ariel Sharon said Syria would start a war the next day. After the meeting, someone asked him where the war would end. He replied, “The other side of the canal.” The Suez Canal may not have been on the minds of country’s leadership, but it was Sharon’s objective right from the beginning. People in the north knew what was going on. The government did too. They watched the Syrian buildup, but managed to find explanations for it that did not lead to hostilities. By the time they realized it was for real, the whole system was taken by surprise. According to Elliot Chodoff, the security expert who was leading our tour, launching the war on Yom Kippur was a Syrian strategic error. The Israel military’s strength lies in its reserve troops. Israel’s compulsory military service includes reserve duty until age 40. Every year, much of Israel’s work force has miluim for at least two weeks. The reserves are well trained and can move quickly when necessary. However, it takes time to call them up and get them into their units. The minimal response time for the reserves is 72 hours. That’s why last summer reserves were called up, a few units at a time, weeks before the IDF actually went into Gaza. If Syria had attacked a week later, the IDF response would have been more disorganized. It would have been the middle days of Succot, when most people are off from work, and traveling. Cell phones were not ubiquitous in 1973, so contacting people would have been difficult. Once located, soldiers would have needed to take their families home, get their uniforms and equipment, and then get to the assembly point. Traffic jams all over the country would have worsened the situation. But instead Syria attacked on Yom Kippur. Everyone was at home or in synagogue. Telephones rang in living rooms and someone answered. Messengers went into synagogues and men got up from their prayers. The roads were empty of traffic; it was easy for soldiers to get to assembly points. And all traffic flowed in one direction: from the population centers to the front. Although Israel’s military response may have been faster than the “required” 72 hours, it was nonetheless too slow. For the most part, the country was taken by surprise. Until the last minute many military leaders and government officials denied the possibility of war. Their lack of preparedness is still being criticized today. But the timing did, in a way, work in Israel’s favor, because there was another important factor that I had never considered before: the moon. Yom Kippur is the tenth day of the lunar month. The moon is almost full, and it shines most of the night. Four nights later it would be shining brightly all night long, and would not significantly wane for Four nights later it would be shining brightly all night long. It would not significantly wane for several days. The night time battles took place on the 11th to 15th nights of the lunar cycle. Night vision goggles had not yet been developed to be used in combat. The phase of the moon was a significant factor in battles. It did not work in Syria favor. Here in the Golan, the Syrians had 1600 tanks. Israel had 90 tanks, which were reduced to 7 by the end of the fighting. The IDF positioned their tanks during the day, and then turned off their engines. Anything moving during the night would thus identify itself as Syrian. The Syrian tanks were clearly visible in the moonlight and were targeted. Because the IDF was not prepared for war, its victory in the Golan was won at high cost. After terrible setbacks in the first days and the loss of many lives, the IDF was able to advance and take the Golan. The road to Damascus was open. Israel might have taken it, but there was no reason to do so. Their lines were defensible; they could protect the Galil from Syrian fire and incursion. Farms in the Golan, as seen from Mt. Avital. Today part of the Golan is under fire again. This time the Syrians are fighting other Syrians. We watch and wait. And for now, the Israeli-controlled part of the Golan is at peace. We hope it will remain so. Our tour bus bumped down a stone strewn dirt road. We had driven steadily upward through the Golan for 45 minutes. I thought that by now we must be close to the Syrian border. I was soon to find out just how close we were. We pulled up in front of an abandoned two-story concrete building. The concrete walls were pocked with holes and the steps leading to the entrance were crumbling. Through the glassless windows, we saw a series of small rooms running the length of the building. None of the rooms had any furniture; graffiti was painted on many of the walls. Once this had been a school or an office building. Now it looked like a bombed out wreck. Before we left the bus, Elliot Chodoff, a security expert who was our leader for this tour to the border area, organized by Honest Reporting, told us to be careful. We would be going up to the roof, but should not lean on the stair railings–there was no telling how safe they were. He then led us to the building entrance. At one time this building had been Syrian headquarters on the Golan Heights. It had been built in the 1950s by the Russians, in classic Soviet functional style. It had been built to last; although it had suffered a direct aerial bomb attack, it had survived. We were able to see some of the reinforced concrete and exposed rebar construction as we walked through the building. We walked up the winding stairs carefully. There were pebbles and dirt on all the stairs, and gouges on their edges. The railing did look sturdy enough in some places, but some of it was obviously not trustworthy. The second floor corridor was muddy, with puddles in some spots. A previous visitor had placed broken stone on the floor to keep his, and our, feet dry. But it had rained earlier this week, and a couple drops of water dripped on my head from overhanging debris. Orthodox icon on wall of former Syrian military headquarters. painting. It was incongruous to see such a large full color Orthodox icon in this wreck of a building. Not understanding the symbols, I wondered what saint it was, and why it had been painted here. We climbed an enclosed stairway at the end of corridor and emerged into the sunlight. We stood there on the roof and looked all around us. We saw vineyards, fruit orchards, and flat green fields. To the north, we saw the Hermon, a long snow capped mountain range, which marks the border between Syria, Lebanon, and Israel. On the other side was Kuneitra. Elliot told us to be quiet and listen for a moment. In such a pastoral setting I expected to hear birds. What I heard was the boom of artillery. Syria’s civil war was less than three miles from us. Several people shifted their feet uneasily; others looked a little worried being so close to the war. Not so long ago, the Syrian forces directed their fire at the rebels from the east to the west. A stray shell landed in Israel and exploded. Assuming it had been an accident, Israel registered a mild protest. A few days later, another shell landed in the same area. Another accident? Perhaps, but not very likely. Israel protested a little more strongly. A few days after that, a third shell landed in Israel. Israel destroyed the battery that had fired the shell. Israel does not want to escalate conflict–our response has always been graduated. The IDF artillery forces practice for accuracy. They say that from the Golan, they can hit the garbage can of their choice in Damascus. That is probably an exaggeration, but the point is that a response must be one that the Syrians can accept as justified. Few stray shells have fallen that area of Israel since then. The Syrian forces now fire on the rebels in a north-south direction. We looked around us, as Elliot explained what we saw. To the east was the town of Kuneitra, in Syria. Israel had captured it in the 1973 Yom Kippur war. During the ceasefire negotiations, Syria demanded that Israel withdraw to the line of volcanoes to our north and west. That was not a defensible position and Prime Minister Golda Meir refused. In response, Syria asked for the town of Kuneitra (Qunaitra). President Hafez Assad promised the town would not be used for military purposes. It would be rebuilt as a town for about 15,000 civilians. In the end, Israel retained the line of volcanoes and some of the plain to their east, where we were standing, and Syria got Kuneitra. We looked at it from the distance of a little more than a mile. It does not appear like a thriving town with a population of 15,000. It looks abandoned. The only thing built since 1974 is an observation tower. A new Kuneitra has been built further away, but it is a military town. Always…except. The two words do not belong in the same sentence. We can always trust Syria to keep its promises except when it does not. We then shifted our attention a little northward, where the UN observers are stationed. A dark green fence runs right behind them. The fence is new–it’s been there only about two or three years. For 67 years, Syria has been an implacable enemy of Israel. About 80% of the Syrian army was focused on Israel, and the IDF faced them. Israel’s biggest fear here was a massive frontal assault. But neither Hafez Assad nor his son Bashir wanted to engage in another major attack. The last one, in 1973, had been disastrous for them. After the cease fire in 1974, the border was stable and no fence was erected. The two countries had a clear-cut relationship; either everything was calm or it was in crisis. When things were quiet, about 99% of the time, a fence was unnecessary. When things were in crisis, the border was a very dangerous place, and a fence would have been pointless. But when Syria collapsed a few years ago, the border area became unstable and unpredictable. No one controls it. Israel no longer faces an enemy army, but many hostile groups. None of them are predictable. A barrier, one that could quickly detect and deter enemy activity, became necessary. Like security fences elsewhere, this one has electronic sensors along its length: touch sensors, motion detectors, infrared cameras, and ground radar, according to Peter Murtagh of the Irish Times. The sound of the nearby bombardments was making some of us more and more nervous. We were glad to walk back down through the bombed out building and return to the bus. Driving away from the border, the road descended into a lush agricultural area. On one side of us we saw rows of grapevines; on the other side was a large orchard of apple trees in bloom. Elliot told us to look out the windows ahead and behind us. We were in a large circular valley, the crater of an old volcano. He told us that the vineyard grew grapes for one of the Golan Heights wineries. Before 1967, when the Syrians held the area, this crater was used for training terrorists.